The Local Market opened less than a month ago in Falls Church, VA. 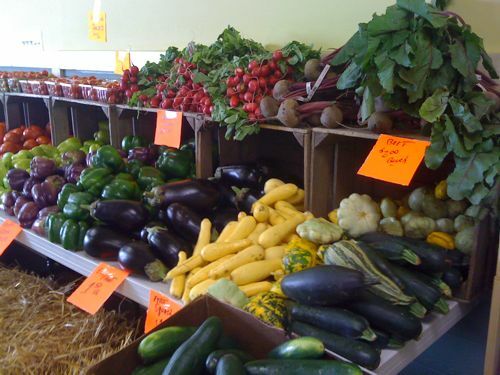 The store features locally produced breads, dairy products, sausages, condiments and in-season fruits and vegetables from farms within a 100-mile radius of the store. The owners, husband and wife team Tom and Laura Coates, came up with the idea after missing too many Saturday mornings at the town’s award winning farmers market, due to their children’s sports commitments. The Local Market is open 7 days a week from 9am to 8pm, so people like me who also often miss the farmers market (due to travel or oversleeping) can have access to all the great produce, dairy products, fresh bread and more any time it’s convenient. I have been wishing for a store like this since I moved to this area, so I was thrilled when two different friends told me that it was coming to town. 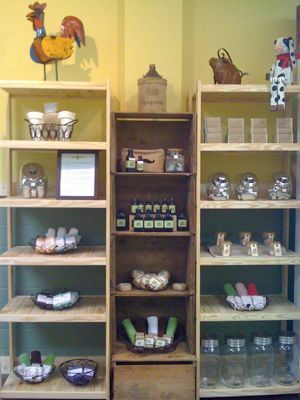 In addition to being a great place to do my grocery shopping, it is the first retail outlet near me to carry my full line of bath and body products, so I love The Local Market even more than I would have! The local press has already given it some great coverage, and word-of-mouth news about the new neighborhood gem has been spreading like wildfire. I believe this store is a place whose time has come, so not only are they going to make it, but I believe it will thrive. So, if you are in town, I hope you’ll stop by The Local Market at 246 West Broad Street, Falls Church VA 22046. Subscribe to the Herban Lifestyle Blog!